I also thought I would share the Spring/Summer and the Fall/Winter versions of my “momwear”. Are you ready for this?! So that’s it… my mommy reality of me in my comfy clothes. What does your momwear look like? Love it!!! I’m not a pjs all day kind of girl (I’m incredibly hot all the time! ), but I love a pair of jeans and a tank top… add on a pair of flip flops and I’m ready to go! And no make-up is just what I do… I never have make up on. :-P Any recent picture you’ve seen of me has no make up… Oh, and pony tail! Must have the pony tail. Jeans and a tank top (or t-shirt) is my leaving the house “style”. Thanks for stopping by Yanic. Love this haha! I love that you just add the sweater and tada! You’re set for winter. Emily and I have been lounging around outside her mom’s house all day with the kiddos. . . I’m thinking we’ll have to snap a picture of how awesome we look in pajamas, which is what we wear, too! My kids always know when we’re going somewhere “real” because I start to put on actual clothes. Oh my gosh this would totally be my uniform as well!! Ten out of ten on the awesomely comfortable outfit scale. I would never take it off. Tank top in the summer and sweater in the winter, covers all of the bases! Make-up pishaw who needs it anyways! I think I need your sockies BTW …. It IS awesomely comfortable. I’m glad you also approve of the versatility of my Momwear. Get those sockies Jen! They would look great with your Momwear LOL. Thanks for sharing in my #mommyreality moment (and for not laughing too hard). My kids do the same thing! Totally like Pavlov’s dog… they see me getting dressed and they’re suddenly harassing me to find out where we’re going. Take that photo ladies… and SHARE it! Thanks for visiting me in my PJs! My hair?! You’re kidding right? It’s swept into a bun-like thing at the back and secured with two extra large barrettes… but I guess if you say effortlessly amazing, I’ll go with that over “lazy bun”! The Banana Republic tanks are so soft and cozy. I love them as my sleep wear! I am totally a PJs girl. When I’m at home, that’s my preferred outfit. Anything else feels too restrictive! Glad you enjoyed this Courtney! Well at least you look super cute in your “uniform.” :) On the days I don’t work, if we aren’t going anywhere, I change from my PJs into yoga or some other sort of comfy pants. I might as well stay in my PJs, ha! LOL glad you think I look cute in my “uniform”. Yoga pants totally could be PJs! I actually text a pic of me in my “Uniform” (yoga pants and a hoodie) to my husband when I get home so he knows I got home safe haha. In the summer, my uniform must change since our central air is broken (booohooo) so I am usually in the ONE pair of shorts I have that fit and a t-shirt. All my tank tops are either from before I was pregnant, too small, or while I was pregnant, stretched out. I think I need to go shopping! Holy cat. And my kids always say “Where are we going?” when I get my real clothes on too. No fooling them!! Funny how we get completely stuck in a “rut” when it comes to comfort clothes! Our children are “trained” to know when we get on “real” clothes it means business! Too much awesome mommy reality here for words. We’re all either really brave or really crazy ;) Love the seasonal adaptation lol! GREAT POST! Brave or crazy is right! Yeah, I thought I would provide the seasonal adaptation for everyone’s benefit, as the look does change “dramatically” according to the temperature it is outside *wink*. Thank God, you posted the “Get the Look” reference in the corner for us readers longing to mimic! You RULE for being the first brave one to join in the challenge this week! This was a toughie! 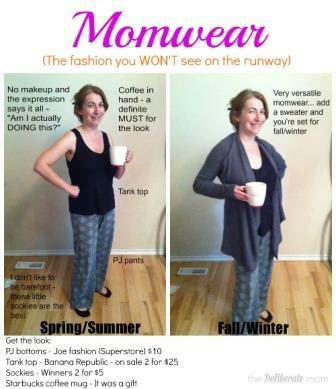 Well, I wouldn’t want others to miss out on the opportunity to get this fabulous, “one-of-a-kind” Momwear! Thanks for visiting (and not laughing too much at my droopy PJs)! Glad I’m not alone in my “fashion sense”. I guess that’s the upside of living in your PJs… it doesn’t take much to look “fancy”. At least your mom wear is stylish! Mine is 10 year old star and moon pj’s that don’t match! Love this and the #momyreality hasthag ya’ll use! Star and moon print… wow! They PJ bottoms are fairly new (less than 1 year old). Prior to that I had a pair of grey PJ bottoms that about four years old and were grease stained from eating popcorn in them (and frequently dropping butter smothered popcorn on them). Disgusting! It’s a fun challenge. Are you going to show us your Momwear Kristen?! I very much enjoy the transition from spring/summer to fall/winter! It just works! For me, I might have an iced coffee in the first photo. I generally wear a t-shirt or tank top and printed moose pants. Yes that transition from spring/summer to fall/winter is essential. Moose printed pants hey?! Wow! I think we need to see a picture of that! Wow, I wish my Momwear included something other than my PJs. You’re doing pretty awesome in my books! Glad this made you smile. Have a great day Sanz! You look better in pj’s thank I do dressed up. Truth. I can’t show you my pjs. I’m pretty sure a picture like that is against the law. I think it’s great that you’re playing along. I’m glad you think my Momwear doesn’t look too bad. LOL – your PJs… against the law. It can’t be that bad can it?! This has been a fun challenge. I’m glad I participated. I know Topaz! It’s hard to believe not everyone is sporting this “fashion” (that’s why I included the “Get this look” section). Glad you enjoyed this… I hope it made you smile. You look adorable! This is the third mommy-reality challenge I’ve seen where the mom looks great in her casual clothes. And bonus points to you for going seasonal! I’m also a sock person. Cant go without ’em! I look great in my PJs?! No makeup?! Hair up?! Okay… I’ll take the compliment. Hi Jennifer, love the winter to summer look, so classy yet so simple and the mug of coffee is definitely a Mummy essential – I wonder if they do a back pack like runners use that would hold hot coffee. PS – you look great without make up! I’m all about versatility Debbie! Thank you so much for the compliment that I look good without makeup… whew! I was getting a little nervous with this picture of me makeup-free and wearing my comfy clothes would be splattered all over the internet and haunting me forevermore! You won’t see me without my coffee. It gets me through the day with a smile on my face! Oh, I am sure these photos will back to haunt us, but by then hopefully we will look so old and haggard that they will actually look good! Hey Jen, Not only do I think you WOULD see this on a runway but I think you should create the line of clothes! I truly believe you are sitting on a land mine of an idea! Momwear. LOL rally Susie?! Do all moms wear their PJs all day?! Ha! Glad you think my “fashion” is acceptable. Sorry to hear about your job my friend. Please do take care of yourself. Hahahahaha oh my gosh, I LOVE YOU!!! How did I miss this post?! I was seriously laughing out loud, you totally nailed the mom uniform. Although I’m going to admit that in this summer heat, I have lost the pants on some mornings. Just the tank up and underwear is what I look like making breakfast some mornings lol! Sooo hilarious in the second photo you just added a little sweater, haha! I’ve got to do a post like this. Thank you for your honesty! The mommy blog world needs a lot more of this! So glad you enjoyed this and that it gave you a laugh. YES… you have to share your Momwear (nursing bra and all) LOL. Oh, how did I miss this? You are so cute, and oh, so funny. Love the look–stay comfy! Glad you enjoyed this Mia. Yes, comfort is a critical component of the Momwear. My mummy uniform is very similar… features Thumper a little too much at time, and I live in the UK so my fall/ winter sweater is considerably thicker! Glad to know you have a similar mom uniform. What can I say… I love my PJs. Glad you enjoyed this Katie!